The last days of the year are numbered but the twelve months that had passed have been blessed with colorful and exciting football, tennis, and basketball headlines worth revisiting for sports fans and bettors alike. Playing for Cleveland Cavaliers in a match against San Antonio Spurs, LeBron James only needed to score seven to cap his 30,000th point. He ended up scoring what he asked for, making 28 points in the match that ended in a Cavs 114-102 loss to the Spurs. LeBron made history that night when he became the youngest and seventh player to have scored at least 30,000 points in NBA history. Additionally, he is also the only player in the league’s history with 30,000 points, 7,000 rebounds, and 7,000 assists. Christian Erikson’s 11-second goal shown in Tottenham’s match with Manchester United becomes the third fastest goal in the Premier League, after Ledley King and Alan Shearer respectively both of which made ten-second goals. The goal was crucial in the Hotspurs 2-0 win over Man United. Playing as forward in Real Madrid, Cristiano Ronaldo kicked his 300th goal in La Liga in a Saturday match against Getafe. The goal was made just before half-time with the help of Karim Benzema. Ronaldo is the only player to have made at least 300 goals in the Spanish Primera Division along with Lionel Messi. Ronaldo, however, reached the number in only 286 matches, compared to Messi’s 334. Then-No.1 of ATP rankings Rafael Nadal stretched his Open Era record after winning his 40th consecutive set win on clay on Barcelona Open, breaking to the quarter-finals. The match was the 76 title holder’s 397th match victory on the surface. After serving as manager of the Premier League slate Arsenal for over 22 years, Arsene Wenger made his last games as Gunners’ coach throughout the month of May. In his final game, Arsenal scored a 1-0 over Huddersfield Town FC. The match was a filler to Arsenal’s loss to Atletico Madrid in the Europa League semi-final under his watch. South Korea dominated in the World Cup last June. Tottenham’s Son Heung-min goaled in the sixth minute of stoppage time for South Korea, upsetting Germany. The match concluded in a 2-0 South Korea win, which resulted in Germans graduating out of the World Cup. After nine years at Real Madrid, Cristiano Ronaldo left the Spanish Primera Division for Serie A club Juventus for a £105 million transfer fee, the highest fee ever paid for a player over 30 years old, and the highest fee ever paid by an Italian club. Sloane Stephens defended her US Open title in a 6-1 7-5 victory against Evgeniya Rodina of Russia. Stephens jumped for more than 900 spots in the world rankings after winning against No. 15 seed Madison Keys in the Grand Slam last year. She made her comeback by bagging her 6th title in the current year’s Miami Open, and was a finalist for the first time at the French Open. Naomi Osaka made history became the first Japanese woman to hold Grand Slam title, after winning against 23-time title holder Serena Williams. She rose to 12 spots up the rankings, overpowering previous year’s US Open champion Sloane Stephens. Arsenal dominates in the Premier League under coach Unai Emery. Arsenal bags ten consecutive wins under new manager Emery. The Gunners are scaring clubs in the season as they went on to bag consecutive victories with the help of Mesut Ozil under new management. The victory was Arsenal’s second continuous conquests since 2007. 21-year-old Alexander Zverev stunned World No. 3 Roger Federer in their Nitto ATP Finals match in London, becoming the first German to do so since 1996. The season-ending match was a high-quality victory for Zverev over the six-time former champion. Real Madrid midfielder Luka Modric shocked the world when he emerged as the top name of the year’s Ballon d’Or with Cristiano Ronaldo only ending at second and Lionel Messi at 5th. The event was notable as it ended the decade-long Ronaldo-Messi reign in football world’s most prestigious award. Modric led Croatia to the second place in this year’s World Cup and helped Real Madrid gain three Champions League titles. 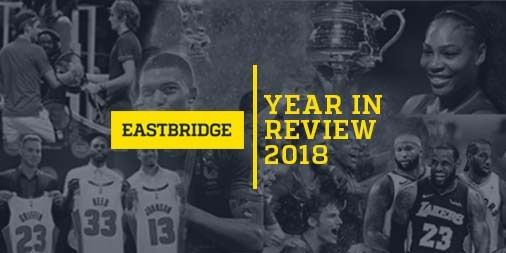 Connect with Eastbridge betting brokerage for more news and features on football, tennis, and basketball. Got your bets ready for a new year of sports action and betting? Contact us on our Skype betting service and we will have your bets placed for you or try out the high level features of our partner sports trading platform VOdds.